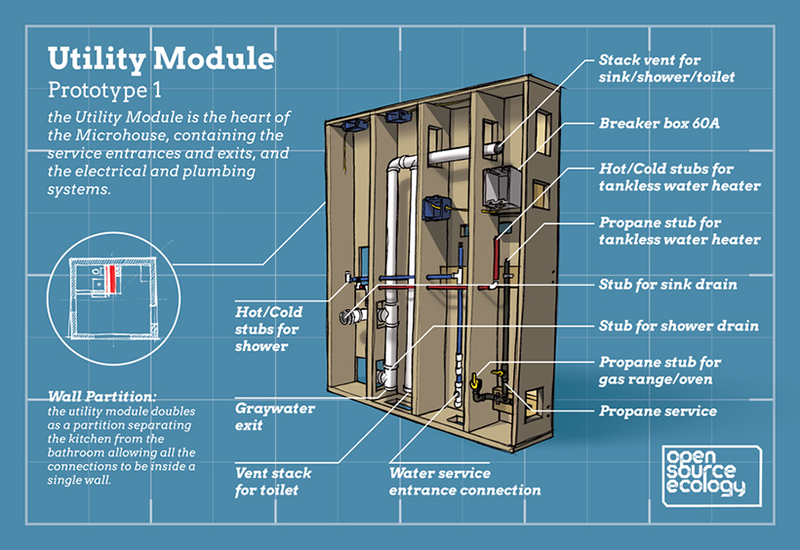 The MicroHouse is a modular building system core that is designed for add-ons. Design is highly modular to allow for building of parts to happen in parallel, where the resulting parts are plug-and-play as much as possible. See the work log of Chris Reinhart, OSE’s Architecture Lead and Construction Manager, for updates. 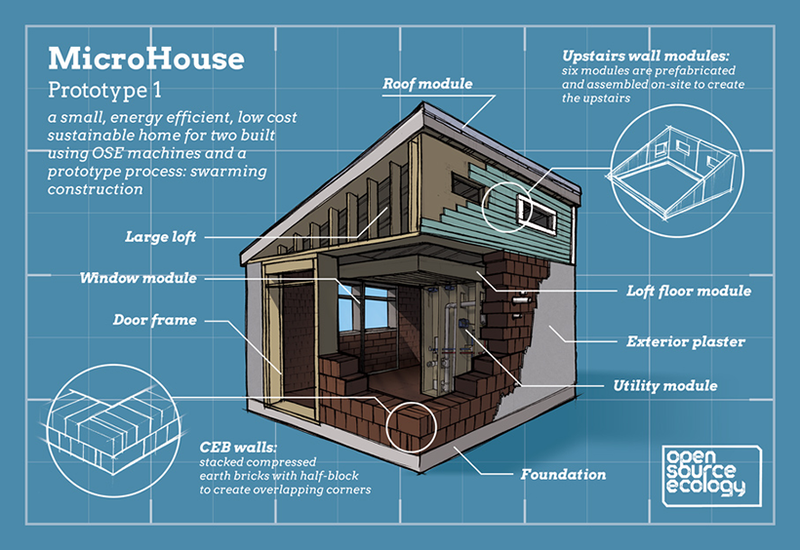 We are currently exploring several new directions for the Microhouse. One is a lightning-fast build by using our 4″x4″ steel tubing to build xyz-bolted-corner space frames as a temporary support frame so that the roof can be built at the same time as the compressed earth brick wall. We can thus integrate steel construction with natural building – taking advantage of rapid construction times. 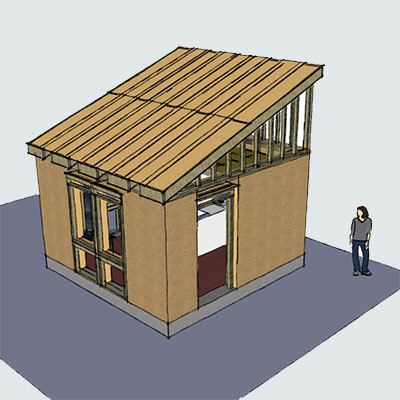 We are also considering the use of WikiHouse roof structures for rapid build using digital fabrication with plywood panels, and once we succeed on the Strawboard Machine – we will be able to produce our own semi-structural or structural building panels made from straw. Combined with the Sawmill for making lumber, and with the Bulldozer for earthworks, Backhoe for digging, and Trencher for trenching, we will be able to do state-of-art, eco-friendly construction at minimal cost. We can focus on sustainable materials such as compressed earth brick, strawboard, and local lumber – but advanced materials such as steel can also help. Use of steel space frames can allow us to build multiple space frames at the same time with a larger team – so we can build a full workshop structure in a single day – starting from a foundation. Another direction that we are exploring is a Mobile Microhouse – a trailer made from our 4″x4″ steel tubing. This integrates well with our 4″x4″ tubing, just like we use with the tractor. 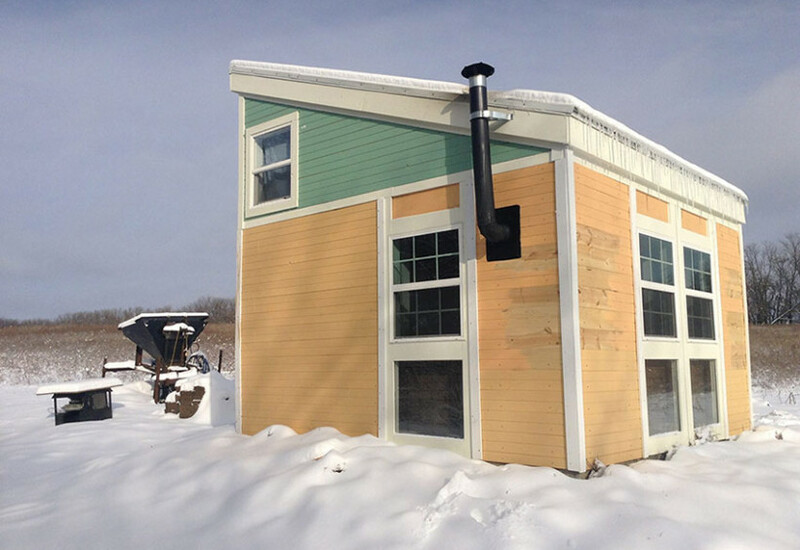 If we can build a Mobile Microhouse, then we can also build other modular, scalable trailers. For small homes, we may want to use 1/8″ wall square tubing – but heavier wall up to 1/2″ wall can be used for larger or stronger structures. 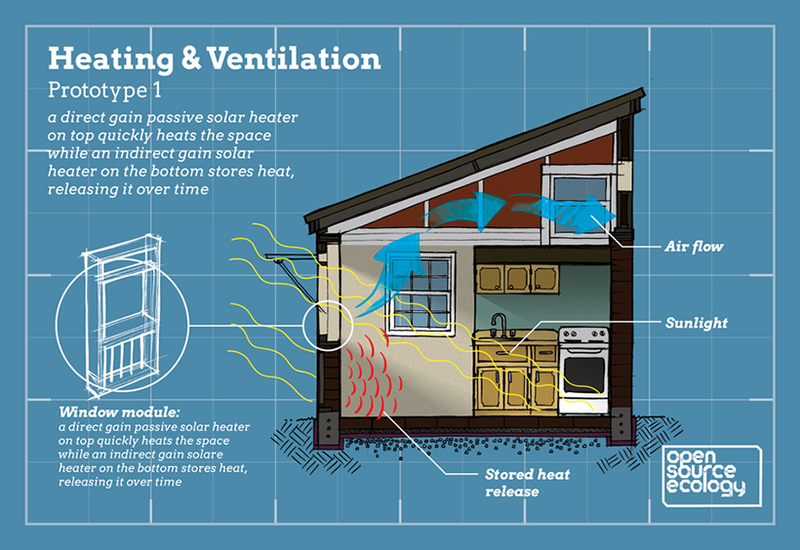 If we put our microhouses on wheels, we can reconfigure our buildings to meet changing needs. By allowing for build speed and high flexibility, additions such as greenhouses, closed-loop blackwater biofilters, multiple story buildings, and other architecture forms become possible. We are exploring all of these options. 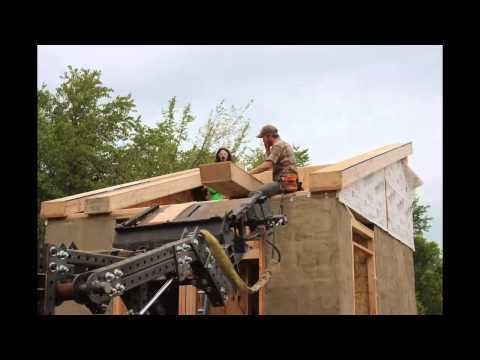 The ultimate level of housing autonomy involves making our own materials. We have done this for compressed earth block – and future frontiers include lumber production, strawboard production, melting scrap steel or glass cullet with the Induction Furnace to produce structural steel or glass, using the bioplastic extruder to produce glazing from plants, and baking limestone to produce cement. We would also like to install a biogas electric system fed on grass clippings, where calculations indicate about 5kW continuous electrical power from 200 pounds of wet grass clippings per day. Combined with our Solar Concentrator electric system, 50 kW Wind Turbine, and modern steam power fed by pelletized biomass, we would like to demonstrate complete energy resilience from widely-available resources.